The thought of meeting a bear in the wilderness sends a jolt of fear through my body. I really did not know that much about bears except the terrifying stories I’ve heard on the news about bear attacks. Watching Disneynature “Bears” gave me a new appreciation of this majestic creature. I still wouldn’t want to run into a bear out in the woods, but I do have a better understanding of their true nature now. 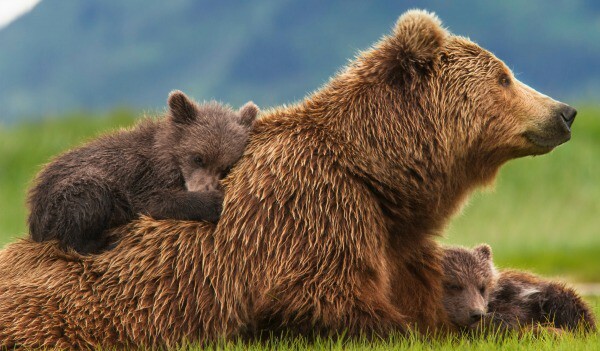 In “Bears”, we meet a brown bear mother named Skye and her two young cubs, Scout and Amber. The film begins with mom and cubs emerging from their den high on a mountain in Alaska after a long winter. They begin their long journey down the mountain in search of food. Skye needs to eat so she will have enough milk to satisfy her cubs through the next long winter. Life for a bear isn’t easy. For Skye, it’s a fight to just stay alive. She has to watch out for the male bears who see her cubs as food. Bears aren’t the only predator she needs to keep her out for. She must also watch out for wolves. There are a few tense moments in Bears where Skye must protect her young against these predators. I was rooting for Skye and her cubs and wanted to see them live and flourish. 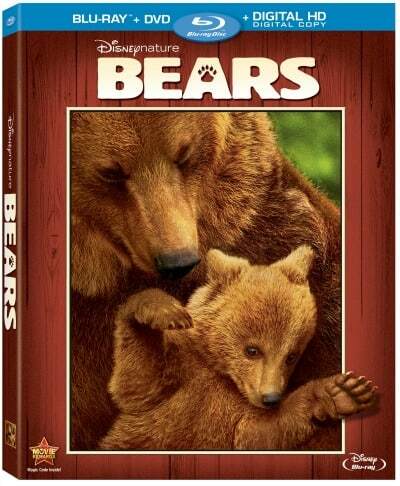 The film also shows that Bears have a personality. Amber was a mama’s girl and was never too far from her mom. She even rode on top of her through some of them journey. Scout, on the other hand, is bold and adventurous. He likes to explore and in one instance, finds himself in a dangerous situation. I almost cried at one point when I thought Scout was gone for good. Besides learning about bears, I also had the opportunity to see the spectacular Alaskan landscape. I had a view of where bears make their home among pristine rivers and mountains. It was truly something! I have great respect for the filmmakers who recorded the bears amazing journey! John C. Reilly narrated the film and did a fantastic job. He made me laugh at a few points and brought me close to tears at a few tense moments. Bridget and I watched “Bears” together. It was not only educational and opened our eyes to many things we did not know about bears, but it was also inspirational. The film portrayed a mother’s love and how she is fiercely protective of her young. This would be great to watch with the kiddos. I think both my oldest and my youngest would love to see it! Sounds like a great family movie, thanks for the review! I want to see this movie, a great family film!! Oh I’d so love to see this movie. I know K would enjoy is so much. Thanks for the great review! Another educational video from Disney! We so wanted to see this in the theatres but somehow missed it. I can’t wait to see it on DVD! This movie sounds absolutely beautiful. my kids have asked me a few times to watch this movie! looks great! I love to own movies like this not only for myself but also to have when my grandkids come to visit or when people with kids come to visit. It is so nice to have something safe to pop in the dvd player and not worry. Like you I also love the beautiful scenery in these movies, and have great respect for the photographers and their patience waiting for the shots.